BaitRageous: Deer antler extract results. The WLRA is puzzled by all the confused deer that they are discovering in the woods. It seems to be wide spread and affects both bucks and does. Further research has pointed to the increased use of deer antler extract. 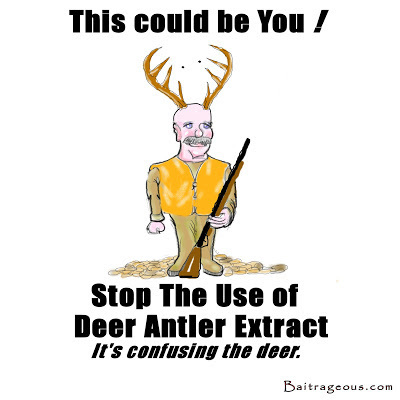 In fact, the agency is starting a campaign to stop the use of deer antler extract. Below is the possible new advertising. I hope you liked the humor! Get away from the big screen and get on a big stream. Wow, I guess the more you use it, the better your antlers look.